Both Democrats and Republicans claim their parties will this year put a new focus on alleviating poverty in America. 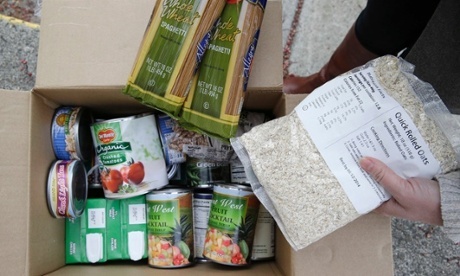 But not even a month into 2014, Congress is preparing to cut around $9bn from the food stamp programme – a measure that will take food out of the shopping baskets of nearly a million households. The reduction is contained in the Farm Bill, a giant piece of legislation that sets spending levels for federal agricultural and food policy and was expected to be unveiled as early as Monday. In November the food stamp programme, which enables almost 50 million Americans to exchange government-provided credits for food in supermarkets, underwent what was effectively a $5bn cut. Now, changes to the Supplemental Nutrition Assistance Program (SNAP) are one of a raft of cost-saving initiatives in the $1tn farm bill, which sets federal policy on everything from dairy prices and farm subsidies to crop insurance and the labelling of beef livestock. After almost two years debating the farm bill, lawmakers on the Senate and House agricultural committees have reportedly reached a deal which will save around $23bn over 10 years, compared to existing funding. Lawmakers from 41 mostly rural constituencies were being given given a run-through of the huge bill, prior to its release. It could be subject to a vote in the House of Representatives as soon as Wednesday, after which it would move to the Senate. President Barack Obama will then be required to either sign into law a bill that dramatically cuts food assistance to the poor, in what he has promised will be “a year of action” against economic inequality, or to veto it, and by doing so risk the wrath of rural voters in states and districts where Democratic lawmakers risk losing their seats in midterm elections later this year. If passed, the food stamp cuts will be the first legislation affecting America’s poor since Democrats and Republicans both began pledging to address the country’s growing inequality gap. A proposal to restorelong-term unemployment benefits, which were cut last month, has stalled in the Senate. The food stamps programme is among the most contentious provisions in the farm bill. Previous attempts to pass the bill were foiled by opposition from right-wing Republicans who advocated deeper cuts to food stamps. In June 2013 a House vote on the bill unexpectedly failed, after the speaker, John Boehner, a Republican, was unable to muster sufficient support from the conservative wing of his party. House Republicans were pushing for a radical overhaul of the programme that would have cut $40bn from its budget over the next decade. Democrats advocated a much smaller reduction, of around $4bn. Although the details of the draft bill remained confidential before its formal unveiling, the Washington Post and other media outlets reported that lawmakers had reached a compromise that will see $8bn or $9bn cut from the programme. The reduction will be achieved by tweaking rules relating to a heating assistance programme that is used by some states to determine a person’s eligibility for food aid. Supporters of the move say it closes a loophole that allowed some states to provide nominal heating assistance to households in order to automatically increase their federal entitlements under the food stamp programme. The Congressional Budget Office estimated that the measure would save $8.7bn but result in 850,000 households losing, on average, $90 a month. The number of people receiving such benefits has grown sharply since the 2008 financial crisis, from about 26 million in 2007 to nearly 47 million in 2012. November’s $5bn cut occurred with the expiration of a special provision, contained in the 2009 stimulus bill, which was designed to offset the economic hardship caused by the recession. Feeding America, the leading network of food banks in the country, says food banks do not have the capacity to accommodate the extra demand that would be expected in the event of these cuts. The charity’s outlets provide for people who are either ineligible for food stamps or who find that their allocation does not stretch far enough to feed their families. Feeding America, which has doubled its capacity since 2007, says that demand is constantly growing.